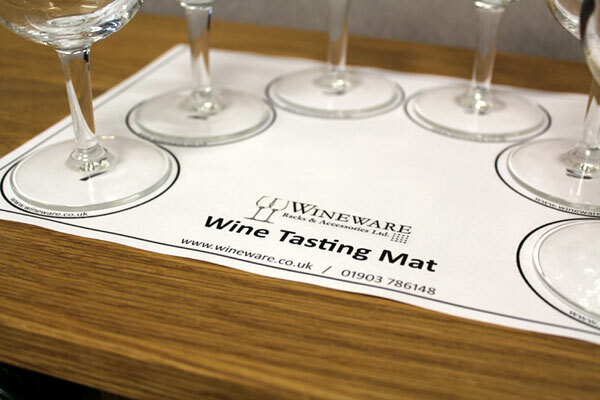 The perfect wine tasting accessory... Wineware's Wine Tasting Mat! If you’re a budding wine enthusiast and often host small (or large) tastings, whether it be for friends and family or clients, then a wine tasting mat could be a great addition! Tastings can range from trying 1 bottle of wine all the way up to 100+, it can seem pretty much endless. However, the normality of small wines tastings is usually 6 bottles (half a case), not too many as you could certainly feel the effects if you’re not using a spittoon! Notes are normally taken when trying each wine, the taste, look, smell, acidity etc all play a crucial part when tasting wine. It’s easy to get each wine mixed up (especially when they’re in identical tasting glasses), but just by numbering each wine and having a simple system will ease the process. 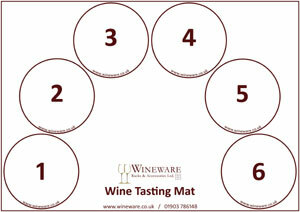 Rather than numbering each wine on the glass or by using a glass tag, why not use Wineware’s very own wine tasting mat! It’s easy to use, simply place each wine (glass) on the designated number (1-6) in the order you wish to taste or compare and make notes on a separate piece of paper (or notepad). You’ll only taste one wine at a time, so simply return the glass to the correct numbered circle once you’ve tasted before making notes or moving onto the next sample. Our wine tasting mat is totally free to download, so why not print some out (in colour or black and white!) for your next tasting! Click here to download Wineware’s Wine Tasting Mat.